●	Buy from authorized or reputable sellers, not from pop-up stands or websites in Asia. ●	Check for NFL seal and that the seal has a serial number. ●	Check the stitching of jerseys and T-shirts. The quality of stitching in authentic merchandise is much higher than counterfeits. ●	If it seems too good to be true, assume that it is. 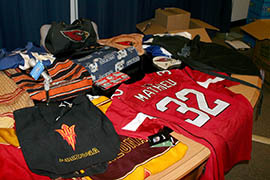 Counterfeit merchandise is generally much less expensive than the real thing. ●	For tickets, check the barcode with the online ticket seller listed on the printout. This Tyrann Mathieu jersey on display Friday at Phoenix Police Department headquarters may look authentic at first glance and probably carried a price tag that seemed like a steal. A closer look reveals red flags, including the lack of an NFL seal certifying authenticity and the lower quality of stitching. 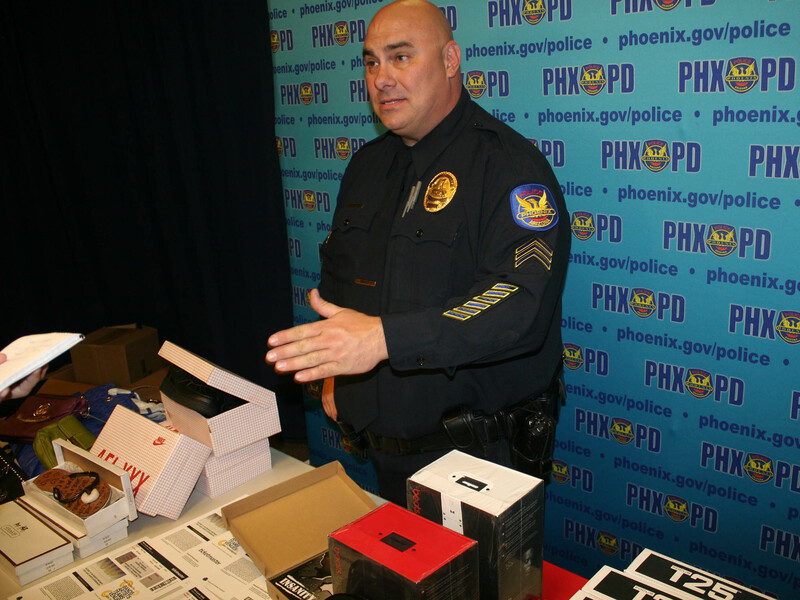 With the Super Bowl approaching, the Phoenix and Glendale police departments, in collaboration with the Department of Homeland Security and the NFL, are spreading the word to those purchasing logo apparel: Buyer beware. Products sold by certain websites and on the street are often counterfeit, they say. A lot of these copies are so close to the real thing that it can sometimes be difficult for the average consumer to tell the difference at a glance. “It could be cups or pens, but they will all have some sort of an NFL seal on them,” he said. Russo also said the general quality of the stitching on authentic jerseys and T-shirts is much higher than that of counterfeit merchandise. Another giveaway is often the price. Authentic NFL jerseys can cost anywhere from $70-$120 from authorized sellers. Allen noted that counterfeiters usually sell their goods for much less. Consumers also should beware of counterfeit sports tickets sold online, including those for the Super Bowl. These fake tickets can be very convincing, with counterfeiters basing their fakes off of real printouts from reputable online ticket sellers like Ticketmaster. Sgt. David Lake with Phoenix Police Department sees these kind of fake tickets regularly and has some advice to check their authenticity. “One of the secrets you can do is you can take a picture of the barcode and run it through StubHub, Ticketmaster or some of the other ticket outlets that are professional resellers and they’ll tell you if it’s counterfeit,” he said. Sgt. David Lake with Phoenix Police Department displays counterfeit merchandise at a news conference Friday. 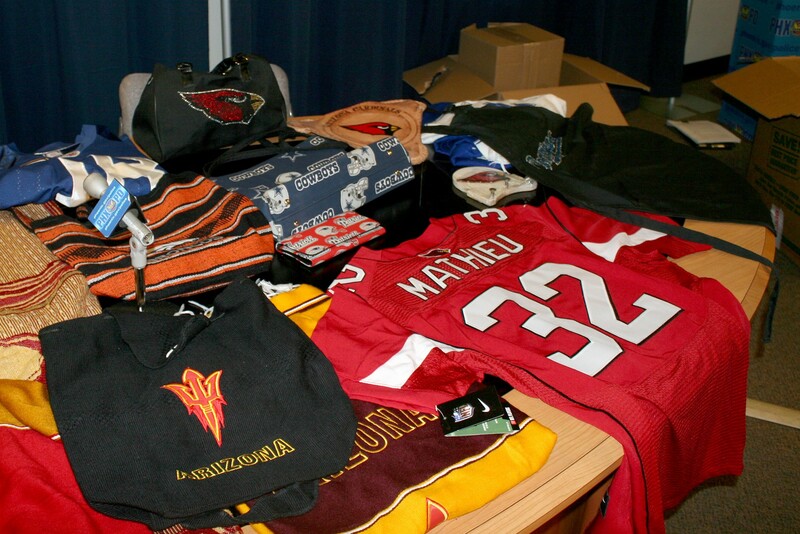 This merchandise displayed Friday by law enforcement agencies is counterfeit. Authorities say the lack of an official NFL seal and inferior stiching are tip-offs.